(JTA) — After a gunman took the lives of 17 students and staff at their high school in Parkland, Florida, students there launched a national campaign to promote gun control. They called for a major protest in Washington, D.C., on March 24, and are encouraging similar protests and student walkouts across the country. And they took a name for their campaign, #NeverAgain, that has long been linked to Holocaust commemoration. Hasia Diner, a professor of American Jewish history at New York University, is unfazed by the students’ use of the phrase. 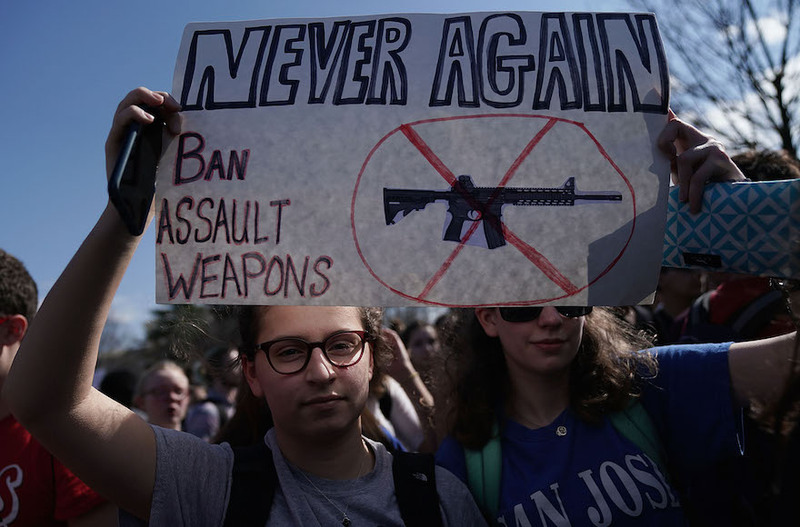 While some may object to the phrase Never Again being reappropriated for gun control, it “does not mean that reaction is appropriate or reasonable,” she told JTA. While some have traced the phrase to the Hebrew poet Isaac Lambdan’s 1926 poem “Masada” (“Never shall Masada fall again!”), its current use is more directly tied to the aftermath of the Holocaust. The first usage of Never Again is murky, but most likely began in postwar Israel. The phrase was used in secular kibbutzim there in the late 1940s; it was used in a Swedish documentary on the Holocaust in 1961. Later, however, Kahane’s violent call for action was adapted by American Jewish establishment groups and Holocaust commemoration institutions as a call for peace, tolerance and heeding the warning signs of genocide. These days, when the phrase is used to invoke the Holocaust, it can be either particular or universal. Israeli Prime Minister Benjamin Netanyahu tends toward the particular when he uses it to speak about the need for a strong Jewish state in the wake of the Holocaust. “I promise, as head of the Jewish state, that never again will we allow the hand of evil to sever the life of our people and our state,” he said in a speech at the site of the former Auschwitz-Birkenau death camp marking International Holocaust Memorial Day in 2010. Then-President Barack Obama also used the phrase in its universal sense in marking International Holocaust Remembrance Day in 2011. That’s similar to how the U.S. Holocaust Memorial Museum uses the phrase. In choosing the name Never Again as the theme of its 2013 Days of Remembrance, its used the term as a call to study the genocide of the Jews in order to respond to the “warning signs” of genocides happening anywhere. And Elie Wiesel, the Holocaust survivor and author who came to be associated with the phrase, also used it in the universal sense. “‘Never again’ becomes more than a slogan: It’s a prayer, a promise, a vow … never again the glorification of base, ugly, dark violence,” the Nobel laureate wrote in 2012. Never Again is a phrase that keeps on evolving. It was used in protests against the Muslim ban and in support of refugees, in remembrance of Japanese internment during World War II and recalling the Chinese Exclusion Act of 1882. And now the phrase is taking on yet another life: in the fight for gun control in America.